Gaura lindheimeri ‘Benso’ pp#14551 “Blushing Butterflies”™ Pride of Place Plants Inc.
Gaura lindheimeri known by its common name 'Bee Blossom' is from the Onagraceae family of plants. A native to North America, it can be found in Texas and Louisiana and as far south as the central regions of Mexico. Gaura lindheimeri, as a native plant is a robust, clump forming perennial form from long branching stems, sparsely foliated with long oval leaves. Stems culminate in racemes of open petal flowers, which open a few at a time. The species tolerates drought, humidity and heat, flowering over an extended period of time. 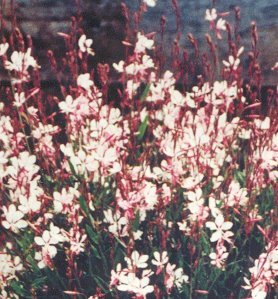 Gaura lindheimeri was scarcely known in normal production nurseries and with the exception of the cultivar Whirling Butterflies was rarely seen. That began to change in 1994 with the introduction of Gaura 'Siskiyou Pink', an introduction by Mr. Baldassare Mineo and his company Siskiyou Rare Plant Nursery, Medford, Oregon, U.S.A. Gaura 'Siskiyou Pink' was found as a pink flowering sport of a white flowering seedling of Gaura lindheimeri. 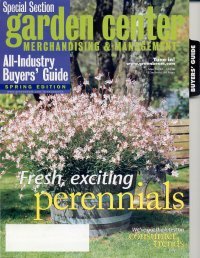 Mr. Mineo and the cultivar 'Siskyou Pink' can claim responsibility for the introduction for the genus Gaura to mainstream perennial growers around the world. 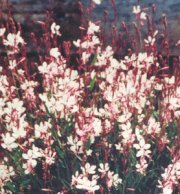 All three "Butterflies" cultivars are offspring of Gaura lindheimeri 'Siskiyou Pink' and were bred and developed by Mr. Howard Bentley of Plant Growers Australia, Victoria, Australia. This New cultivar is more compact than the parent, with very dark green foliage. The blush pink flowers are held upright by stems above the foliage. Mr. Bentley was going to hold this from the market, but members from the trade both growers and those involved in retailing who saw this New cultivar convinced him to ad it to the "Butterflies" series. Height 24", width 24" U.S.D.A. hardiness zones 5-10. It blooms from early spring to frost, but flowers are most abundant in late Spring. The U.S. Patent & Trademark Office has now assigned Gaura lindheimeri 'Benso' " Blushing Butterflies "t.m. the Patent Number 14661. The Patented product,or the packaging or labeling for the product,when the product itself cannot be marked,must be marked with the patent number. A marking such as " U.S. Patent No. P.P.14551 " or " Pat. PP 14551 " is deemed as an adequate notice. 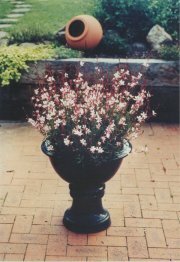 Thank-You for your continued interest in Gaura lindheimeri 'Benso'" Blushing Butterflies" t.m.. The demand for "The Butterflies Collection" of Gaura's continues to grow. All three cultivars have become a " Must Have" for Garden Centers and for the Home Gardener.